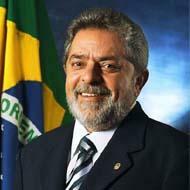 Ignacio Lula da Silva is the former President of Brazil. The man behind Brazil’s Marxist president Luis Ignacio Lula da Silva, Marco Aurelio Garcia has played a hugely influential role in orchestrating the recent advance of socialism across Latin America. From 1969 to 1973 Garcia, a Brazilian, was politically active in Chile during the Salvador Allende regime. Working closely with the Cuban backed Allende, Garcia was also close to Cuban operatives. . In 1980, Garcia helped found the Brazilian Workers Party and has served as it’s Foreign Affairs advisor ever since. In the recent election he was “Lula’s” campaign manager. In 1990 in collaboration with Castro, Marco Aurelio Garcia called a meeting of all left-wing groups from Latin America and the Caribbean. Representatives from 48 different communist parties and terrorist groups attended. This gathering became a near annual event, known as the São Paulo Forum until being replaced in recent years by the World Social Forum movement. As the architect of the Sao Paulo Forum, Garcia controlled and coordinated Latin America’s main socialist parties, communist parties and terrorist organisations from Chile to Mexico. Far from being a possible US ally in any political effort intended to stop the neo-communist rise in Latin America, Brazil has been for many years the real strategical center where from communist action spreads to the neighbouring countries. 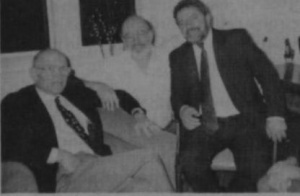 The very decision to found the São Paulo Forum was taken by Fidel Castro in a meeting where, to his own exception, everyone present was a Brazilian: Lula, Frei Betto and Bernardo Kucinsky. Lula, a Brazilian, presided the organization for twelve years. The Forum’s official magazine, America Libre , is run by a Brazilian, Emir Sader, while in the editorial board most of the members are Brazilian. The main political articulator of the Forum’s meetings is also a Brazilian, Marco Aurelio Garcia. If Lula is right to say that the many victories obtained by the Left in the continent are due to the Forum’s secretive actions, so they are, in substance, a result of Brazilian political planning. Garcia describes his party, PT, as “radical, of the left, socialist” but that is only partly true. The PT consists of about a dozen major currents, raging from Trotskyist and Marxist-Leninist to left social democratic. 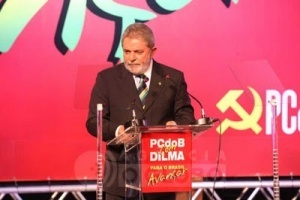 The PT ran in the recent election as a formal partner of the Communist Party of Brazil. Garcia himself is a hard line Marxist. In an article which he wrote on “The Communist Manifesto” he ended “The agenda is clear. If this new horizon which we search for is still called communism, it is time to re-constitute it“. He has also been famously quoted as saying “We have to first give the impression that we are democrats…Initially, we have to accept certain things. But that won’t last.” and “Democracy is just a farce for taking power“. In 1994 Ignacio Lula da Silva was an initiator of the International Peace for Cuba Appeal, an affiliate of the Workers World Party dominated International Action Center. Democratic Socialists of America member Stanley Gacek is a labor attorney and AFL-CIO International Affairs Assistant Director, responsible for the Federation’s relations with Latin America and the Caribbean. He has spoken and written extensively on Brazilian labor and politics and has been a friend and adviser to President Luis Ignacio Lula da Silva and the PT since the early 1980s. Since 1981, he has served as a special advisor on North American affairs to the Brazilian Workers Party. Stanley Gacek is a labor attorney and AFL-CIO International Affairs Assistant Director, responsible forthe Federation’s relations with Latin America and the Caribbean. He has spoken and written extensivelyon Brazilian labor and politics and has been a friend and adviser to Lula and the PT for twenty-four years. U.S. Vice President Joe Biden was in Chile. April 2009, to attend a summit of leaders from Latin America and Europe. Biden flew to Chile early Friday and went to the resort city of Vina del Mar, where the Progressive Governance Summit would take place on Saturday. Biden's three-day visit included bilateral talks with Chilean President Michelle Bachelet and other visiting leaders. Also attending the summit were British Prime Minister Gordon Brown, Spanish President Jose Luis Rodriguez Zapatero, Brazilan President Luis Ignacio Lula da Silva and Argentine President Cristina Fernandez. "I am guilty, as I have often said, of having participated in an armed group with a subversive aim and of having carried weapons. But I never shot anyone." Battisti has been on the run since escaping from an Italian jail in 1981 while awaiting trial. He spent the intervening years in France - where he started a career as a novelist - Mexico and finally Brazil. After he was arrested in Brazil in 2007, the Italian government requested his extradition under an existing bilateral treaty. It said the former member of the radical Armed Proletarians for Communism (PAC) was a terrorist. On Friday - the final day before handing over the presidency to Dilma Rousseff - Lula decided to turn down Italy's request "on the basis of a report by the attorney general", Foreign Minister Celso Amorim said. "I express deep bitterness and regret at the decision by President Lula to refuse the extradition of Cesare Battisti, a multiple murderer, despite insistent requests and urging at all levels from Italy. This is a choice contrary to the most elementary sense of justice," he added. "I consider this situation is anything but closed - Italy will not give up and will make sure of its rights." "seriously offensive to Italy, and above all to the memory of the people who were killed and the pain of the relatives of those who lost their lives. Just the fact that Lula waited for the last hour of his term is a sign of his lack of courage," he added. "It's a disgrace. I'll never tire of saying it." This page was last modified on 28 September 2015, at 03:00.